In little more than two years, Keith Parker has overseen a turnaround in the metro region’s 35-year-old transit system – and not a minute too soon. In recent years, MARTA was perennially referred to as “beleaguered” or “troubled,” as though such descriptions were part of its name. No more. MARTA is on the upswing, with stable finances, improving service and increased ridership – up 9.4 percent in 2014 over the previous year. In the works are projects with implications large and small. The biggest is more transit-oriented developments near key rail stations to bring in revenue and bolster surrounding neighborhoods. Projects like the 7.7 acres next to the Avondale station, which will be transformed into a central plaza surrounded by 600 apartments and condos, and a mixed-use project at King Memorial station that will include 386 apartments and 13,000 square feet of retail. A second initiative is smaller but no less important: a pilot program to test an automated restroom facility to address comfort and convenience. The system, which operates 1,000 route miles of bus service and 48 miles of heavy rail in Fulton and DeKalb counties, has 4,500 employees, including its own police force. This spring MARTA expands into Clayton County, where last November voters agreed to a one-cent sales tax increase to fund transit. 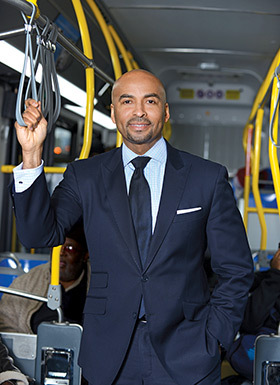 Parker, 48, has previously headed transit systems in San Antonio and Charlotte. In January he was given a two-year extension on his contract, which now runs until 2019. Georgia Trend Editor-At-Large Susan Percy talked to Parker at MARTA's headquarters near the Lindbergh station. Following are edited excerpts from the interview. GT: Let’s start with some of the highlights from MARTA’s past year. Parker: Certainly the ridership being up is something we were excited about. It’s the first true ridership increase we’ve had in almost a decade. Our surrounding transit authorities have been losing ridership, so we are sort of bucking the trend of declining usage. GT: How about MARTA’s finances? Parker: We are seeing a stabilization of our revenues and expenses, so after really just hemorrhaging money for a very long time we have been able to have two successive years of revenue surpluses and been able to use that money to add service back in. Because of the improved financial picture, we were able to go to Wall Street and get an upgrade on our [bond] rating. It makes the cost of doing business a lot less. GT: How does that affect service? Parker: The service improvements – that was a major emphasis area for us. Service cutbacks several years ago made it just too long a wait between buses and trains. So back in May we were able to add a lot of new service back on to the trains particularly. Now during peak periods of the day, a typical customer only has to wait five minutes between trains. Parker: We continue our emphasis on making riding transit safer, using our Ride With Respect campaign. That was a big deal – making people feel safer. Our agency has always been one of the safer large transit systems. But using that campaign, where we were targeting the nuisance behaviors, the panhandling, loud music, people taking up two or three seats while they slept – that gave our customers a greater sense of security, and they enjoyed their trip more. We were able to participate in one of the biggest captures of the year. Our police officers, just doing their normal jobs enforcing the fare policy, were able to apprehend [a fare evader] alleged to have committed a number of murders. Our folks may have saved some lives that day. GT: All that must be gratifying. Parker: The perception of the agency improving was a major emphasis area for us, and we’ve begun to see some fruits of that. MARTA for so long has been viewed as part of what’s holding Atlanta back, and I think people are beginning to see we could be a big piece of the puzzle in terms of a solution. GT: Any achievement you are especially proud of? Parker: The upgrade of the credit rating. We made a trip and visited with Fitch, S&P and Moody’s. They needed to see that we’re increasing ridership and our expenses are going down. They had to have confidence the agency was being managed the right way. That was a very quantifiable affirmation of what we’re doing. If we don’t get the financial piece right, nothing else matters. GT: Tell us about the process of reaching financial stability. Parker: By state statute, we have to leave around 10 percent of the previous year’s operating budget in reserves; otherwise, the state oversight committee can take actions it deems necessary to get us back on track. In only two of the last 15 years had the agency not been losing money from those reserves, getting into them. When I came in, we had a projected $33-million deficit for that year; then it was projected we would lose between $25- and $33-million for the next four or five years, until it became fiscally insolvent. We were able to take that $33-million deficit the first year and within six months turn it into a $9-million surplus. The second year we were able to record around a $15-million addition to the reserves. GT: How did you do that? Parker: The primary way was just look at the basics of how we were doing business and look for every opportunity to save money. We had budgeted operating capital of $56 million for IT, for tech-related projects and services; we were able to reduce that to $42 million while improving the overall IT experience for employees and customers. And by switching over almost exclusively to compressed natural gas for our fleet. (We have some diesel buses left.) When gas was even more expensive, while the general market was spending about $3 a gallon for diesel, we were spending $1 for the equivalent gallon of compressed natural gas. That saved a tremendous amount of money. We were able to work out a partnership with Georgia Power. We now structure the time of day we use power. Our subway system runs on electricity, so electric power is a big, big deal for us. That’s going to save us a couple of million a year every year. We did some small things. We were giving everyone a paper pay stub; we converted to an automated fully paperless system. It saves us anywhere from $70,000 to $200,000 per year. The message was more important to us – we’re looking for every way to be more efficient. Saving money makes the product better. GT: You mentioned a fare policy, an effort to stop fare evasion. Is that mostly symbolic or does it save money? Parker: It actually saves real money. We did a variety of things. Most important was closing the doors. Before, when a bus driver reached his layover point and would leave the bus – his scheduled break time – he would leave the door open. Customers would file on; some would pay, some would not. It had gone on for over a generation. We did a big marketing campaign to let customers know: Be at the stop when the driver arrives, pay and take a seat. We saved $2.2 million right away in potential lost revenue. People who jump fare gates and people who don’t do things the right way as they are entering our service, those are the people we have problems with. We want to set a tone of orderliness, following the rules. We think people who come on a bus or train the right way are going to behave themselves. GT: This was part of the Ride With Respect program? Parker: When we instituted the program, our intention was to make the ride comfortable for everyone. We heard from too many people that if you get on a train or bus, especially if you ride for a long time, at some point someone is going to hassle you for money or try to sell you a CD, play loud music. It’s more a quality of life or quality of ridership experience. We use more uniformed officers as well as undercover officers. When people engage in these types of behavior, our folks approach them and write tickets – suspend [riding] privileges for a day or up to year. We have issued in the neighborhood of 3,000 with less than 5 percent recurrences. What that’s saying is that people really are getting the message. We have few repeat offenders. GT: Restrooms are important to MARTA riders. What’s the current situation? Parker: The restroom thing has a lot of history to it. MARTA was one of very, very few transit systems that provided restrooms at every one of the rail stations. Back about six years ago, because of budget cuts, the agency cut out about two-thirds of the restrooms. When I came in that was one of the major complaints: that we need to open some of those restrooms, which we did. We opened six of them. We are still looking at what’s the best way to provide service. It’s extremely labor-intensive – the [customer service] person has to go open the door and wait there while the customer uses the restroom. That’s why we’re doing a pilot project, the Lindbergh project – an automated restroom. GT: You have talked about a “stigma” attached to riding buses. Maybe that’s too strong a word …? Parker: The word “stigma” is appropriate. That’s not an exclusive MARTA situation, that’s an international situation. There are a number of people who will get on a train and feel perfectly okay about it but who would not get on a bus. The Portland area has done an incredible job of making mass transit friendly and very acceptable. Seattle has enormous usage. Parker: In the South, very many people tend to think of buses as transportation for poor people or for people who don’t know how to drive or who have illnesses or disabilities. But if I’m a middle-class person, not for me. We have a good chunk of folks who are train-only users. We want to change that. Parker: If we are going to make every effort to make people feel comfortable about using bus service, one of the first things we have to do is make bus service more convenient. We have to have friendlier, cleaner, quieter buses, and the overall quality of the experience has to reflect that friendlier, quieter, more reliable type of atmosphere. We then have to brand it better, tie the system together. GT: Tell us about MARTA’s Transit Oriented Development program. Parker: We have made major inroads and progress in our program, where we partner generally with the private sector and develop ideas around our stations that bring more ridership for us, make the neighborhood better and bring revenue. We’ve had some huge victories in that regard. The big one was State Farm partnering with us at the Dunwoody station. Ten thousand people will work there, with 3,000 new jobs. GT: What will the expansion into Clayton County mean for MARTA? Parker: It’s huge for us among the existing MARTA family, but it’s actually more important for Clayton folks. We spent a lot of time in Clayton. I would go to public meetings, and at every one of those, someone would walk up to me, generally a senior, and say, “I’m praying for you.” Because they so desperately need the service. I’ve heard these stories about 70-year-old ladies walking two miles to get to a doctor’s appointment. Since MARTA stopped running service there, they had no way to get around. I’ve heard story after story about people spending $25 a day each way for a cab ride to a job that pays $10 an hour. We were supportive about having Clayton join us provided a few things happen. It went from being a business thing for MARTA, where we were expanding our footprint, to being a human interaction situation. It’s personal to us – we want to be a big player in terms of economic development, want to help draw big business into the region, but at the end of day we are also a get-from-point-A-to-point-B transit provider. GT: What will it cost? Parker: Their sales tax will pay for bus service – one half of their [one penny] sales tax. Another half penny they’ve asked us to set aside and use to help develop a high-capacity transit option. Our preference will be for a commuter rail line that will connect East Point, where we have heavy rail, down to some of the major activity areas in Clayton. GT: Do you feel an increased public support for MARTA, a change in attitude? Parker: Yes, we can sense that. There was a sense [before] that MARTA was almost a pariah. When I was first announced, I was getting calls and emails from people saying, “Why in the world go to Atlanta? It’s a mess, the worst job in transit. There’s no way anyone could be successful there.” There was a sense of unease among our employees, wondering if we would even be here in five years. It’s been a complete reversal. Now there’s a sense of people who want to do business with us, companies moving to this area saying it’s a priority – they want to be near a MARTA station. Elected officials are saying our name loudly. Yes, we are seeing a change. GT: I’m curious. Why accept the “worst” transit job in the country? Parker: I wouldn’t call it the worst – it’s the most challenging of all transit systems. We are the only large transit system where people, until recently, are still debating whether we need a transit system: “Why do you need mass transit? Just widen the highways more.” That has quieted down quite a bit, but the larger transit authorities are way past those kinds of arguments. You don’t hear people debating whether you need the Washington Metropolitan Area Transit Authority. You don’t hear people debating whether you need transit in San Francisco and New York. It’s how do we make it better, how do we get more of it. That’s where MARTA needs to be. GT: But what attracted you to the MARTA job? Parker: One reason is that it is such a challenge. If you’re going to jump in and take on a challenge, you may as well take the biggest one. The second reason is that I’m an East Coast person. Most of our family lives on the East Coast. GT: What’s ahead for MARTA? Parker: I hope people are recognizing that our transit system is worthy of investment. My goal is to remove all legitimate reasons why government, individuals and companies would not want to invest in MARTA. We want to partner with private sector development and even sometimes the public sector to make developments that are truly complementary to neighborhoods. We want to shore up our finances, improve our perception, make our employment experience as well as our customer experience better. We feel good about the momentum of our transit system, and feel we are moving in the right direction.